This is part of a continuing series on small changes you can make throughout the year, instead of sweeping, scary New Year resolutions that tend to crash and burn long before you read this post. Each suggested task is a year-long adjustment to your indie business that could reap some very nice rewards. Indie publishing is a game won by increments. Most of us write in small doses because we don’t have the luxury of full time writing. We squeeze production into our spare time. We don’t hit best seller lists the first month out but (often) end up selling more over the long term than last month’s #1; a copy here, a copy there. Check the intro post from January for more on this idea, if you haven’t seen it already. If you jumped straight to the answer, “Books!”, then you’ve just demonstrated that you’re thinking like a businessperson. That’s great. But your indie writing business product does not start and end with your books. The vast majority of indie authors’ primary product is e-books, for that is where most of your sales come from. They’re also cheaper to “stock” and distribute. Many indies go to the trouble of building print-on-demand versions of their books, so that the occasional paper-only reader can try them out. Also, some readers still buy print editions as “keeper” copies of books and authors they like. Print books are product, too – a product you can stockpile (building a formal inventory for your business) and use for all sorts of off-line promotions. They’re also useful for placing in front of naysayers who think what you do isn’t “real” writing. Everything you produce or pay to have produced that helps you sell your books is supporting material. This can run the gamut from printing bookmarks and other promotional materials, through to your website, and merchandising (e.g. a tee-shirt with your book cover on it) – which differs from promotional material because readers pay to acquire merchandise. If you’ve released a handful or so of titles, and your production schedule and processes are nicely settled, you might very well wonder why you should rock the boat with a lot of review work, research, and possibly changing contractors and service providers, and more. Everyone has pretty much agreed that the indie author industry has out-grown its baby stage and has joined the ranks of the publishing world as a grown-up. It’s no longer good enough to throw together your own amateur cover and simplistic interior design for your books. The difference between you and legacy books will be more than apparent, and well-built indie author books will make yours look shoddy in comparison. This will negatively (and perhaps unfairly) affect your brand and how readers, reviewers and other industry professionals perceive your talent and business acumen. Even worse; not striving to improve your product will impact upon your readers’ impressions. Yes, there will be some readers, perhaps even many of them, who know your work, and don’t care what the cover looks like or if the inside of the book lacks images, decent typography or is difficult to read because of formatting glitches. But new readers will probably not give you the benefit of the doubt. Given a choice between your interesting-sounding story, and another equally interesting tale that has a great cover and a decent layout, they’re going to go with the book that looks prettier. Perception is everything, especially when the reader has no idea who you are, or what your writing abilities are like. Readers have started to learn that reviews can’t be relied upon (too many are sock-puppet reviews, and too many authentic reviews get deleted for one reason or another). Without word of mouth recommendations, they will judge a book by its cover and how it looks inside. Does it seem to be well-put together? A professional-looking product will help reassure the reader you know what you’re doing, and make them lean favourably toward buying your book. The bottom line is that a professional, nicely-laid out or formatted book and all the material surrounding it (meta data, logos, promotional materials) help you sell more books. Is there a better reason than that for striving for the best product you can build? Are your covers letting you down? How do they compare to the covers of books at the top of the best seller list in your genre? If there are any big differences, consider having your covers re-designed. (If you built them yourself, find a professional to do the new ones for you). This is one area where skimping will have a massive impact on the final product. You may not have thought about the inside of your book much. A Word file can be uploaded to most of the retailers, and that’s all you need, right? Well…that’s all you might have needed a couple of years ago. Open up your ebook reader and swipe through recently acquired books. Study the order of the front matter and back matter. Also look at fonts, font sizing, paragraph spacing, the use of images, chapter heading layouts…look at everything and compare those books with your own. How does yours compare? How does the book use logos? White space? Font variations? Dividers? If you feel your product is deficient in any way, either take time out to learn the formatting skills you need, buy the proper applications to build a good product, or find someone who can do the work for you to a standard that makes you feel you’re competing with the best of them. If you’re anything like me, then the last time you cracked the spine on a print book was…well, you can’t quite remember. That doesn’t let you off the hook when it comes to your own print editions. If you’re formatting the interior file of your print book using Word, stop right now. Go spend an hour in an honest-to-goodness bookstore. Grab the best sellers in your genre and study them. Look at the cover layout. The way the material on the back cover is spaced. Look at the interior layout – what information is included in the front matter? What is added at the end? The front and back matter and layout of a print book are very different from the conventions of an ebook. You simply cannot use the same file for your print book that you upload for your ebook editions. If you lack the knowledge and skills to make your book look like the others on the shelf, take the time to learn about page design, typography, print processes, paper stock and more. Or, you can look for expert help and service providers who can provide you with a product that will compare favourably with the ones on the shelf. Perhaps one of the most import support materials are the product pages for your books on retail sites. Can they be improved? How do they stack up compared to the best sellers? Also, don’t forget your own website. Does it look as good as other best-selling authors’ sites? All your supporting material, including advertising and promotional products, should give the reader the same impression as your books and their blurbs; uniform branding that promises the reader a great story experience. There is expert help available for any area where you don’t have the time or skills to improve your product yourself. Don’t settle for “good enough”. You can’t afford to – not any more. 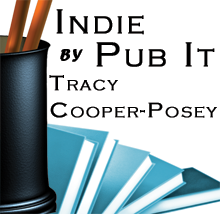 Columnist: Tracy Cooper-Posey writes paranormal, urban fantasy and science fiction romance, and romantic suspense. She has been nominated for five CAPAs including Favourite Author, and won the Emma Darcy Award. She published 35 titles via legacy publishers before switching to indie publishing in March 2011. She has published over 50 indie titles to date. Her indie books have made her an Amazon #1 Best Selling Author and have been nominated four times for Book of the Year. Byzantine Heartbreak won the title in 2012. Tracy has been a national magazine editor and for a decade she taught romance writing at MacEwan University. An Australian, she lives in Edmonton, Canada with her husband, a former professional wrestler, where she moved in 1996 after meeting him on-line. Her website can be found at http://TracyCooperPosey.com.